Ashby Lumber provides milling services on most types of dimensional lumber and sheet goods. 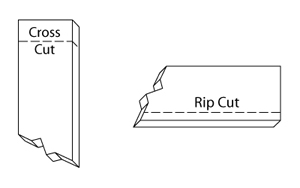 Our saws are capable of matching requested dimensions to within an 1/8″ accuracy on all cross-cuts and rips. Most cross-cut and rips are completed at the time of purchase, however some orders may require more time to complete. Please call our sales team for questions regarding milling orders. **Note: due to safety concerns, we are unable to provide cuts on some materials; please refer to the table below for more information. No rips on pressure treated lumber, cross-cuts only. No cuts on railroad ties. No cuts on sheetrock or lattice panels. No cuts on any painted or sealed material. No restyle of cut doors. Doors must have all hardware removed for trimming. Customer accepts full liability for any damage that may occur to the door during milling. Mill Manager reserves the right to decline any product deemed unsafe for cutting or not from our inventory.